Children's Advil Buy One Get One Free Printable Coupon + Target Deal! Children’s Advil Buy One Get One Free Printable Coupon + Target Deal! Right now you can print a coupon for Buy One Get One FREE Children's Advil! 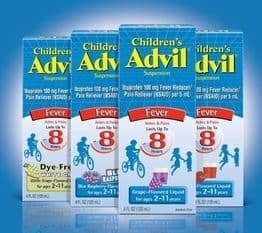 To make this deal even better Children's Advil is on sale this week at Target for $4.49. I don't think I can ever have enough children's ibuprofen in my medicine cabinet, so I'll be taking advantage of this deal!